Now here's a delightful table for the dining room. The Amish North Glenn Double Pedestal Dining Room Table with rounded columns and a decorative bridge stands strong and beautiful. This double pedestal table means no banging knees on any table legs. A country style favorite, this dining table is from the Lancaster Collection and is made by Amish woodworkers who began handcrafting Amish furniture back in 1974. 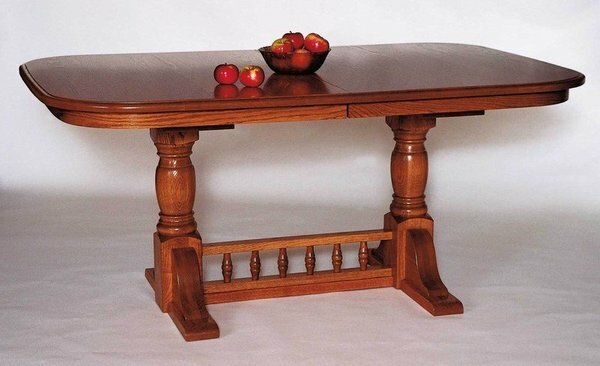 This country style dining table is customized to match your dining room best. Choose the table edge style and add extensions if you need them. Each table extension measures 12" wide and any you add will self store right in the table. Our Amish Sheaf Back Dining Chairs make a lovely match for this dining table. The final look is up to you. Email or call now for personal service from an Amish Furniture Specialist. We thank you for shopping with DutchCrafters, the #1 online retailer of Amish furniture.